And the first up is Cranberry-Orange Pinwheels. It's a Better Homes and Garden's Recipe, found here. I adapted because it had too many steps. Hopefully made it easier. And they are good. Really, really good. 1. For filling, combine cranberries, pecans, and brown sugar in food processor, chop finely. Set aside. 2. Combine butter, sugar. Add baking poser, salt, eggs, orange peel. Mix in flour. Add enough flour to form a firm ball. 3. Roll dough on a floured surface, creating a 12x12 inch square. Add more flour if it's sticky. Spread filling evenly over dough. Roll dough and cut into 1/4 inch slices. Placed on a greased cookie sheet. 4. Bake in a 375 degrees degree F oven for ~9-10 minutes or until edges are firm and bottoms are lightly browned. Transfer to a baking rack and cool. 5. Whisk powdered sugar, vanilla and milk until drizzle frosting consistency. Drizzle over cooled cookies. Enjoy! 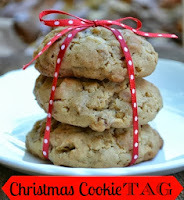 As mentioned, this recipe is first up in Cookie Tag. It's my job to tag the next blogger. I'm going to tag...get ready for this...drumroll...TAMMY from http://www.ourneckofthewoods.net/ . Tammy, you're IT...meaning it's your job to provide us with the next delicious cookie recipe that we MUST try ASAP. I can't wait! Readers-it's your job to check Tammy's blog, as in the next couple days she will be blogging a cookie recipe and tagging the next blogger. Believe me, you don't want to miss all the yummy tidings of joy. We bring you yummy tidings of joy. I have never made a pinwheel cookie, but these make me want to try! Found you via Tammy @ Our Neck of the Woods. Oh my goodness! These look Ah-mazing! Thanks for sharing! I'm giddy about this cookie sharing business! Woohoo! Bring on the recipes!